You are working for a startup. Suddenly that hard year of coding is paying off, but with success comes more growth and demand for your web app to scale. In this tutorial, I want to humbly use one of our more recent success stories around ourWebGL open-source gaming framework, babylon.js and its website: babylonjs.com. We have been excited to see so many web gaming devs try it out. But to keep up with the demand, we knew we needed a new web hosting solution. While this tutorial focused on Microsoft Azure, many of the concepts apply to various solutions you might prefer. We are going to see also the various optimizations we have put in place to limit as much as possible the output bandwidth from our servers to your browser. Babylon.js is a personal project we have been working on for over a year now. As it is a personal (i.e.our time and money), we have hosted the website, textures and 3D scenes on a relatively cheap hosting solution using a small, dedicated Windows/IIS machine. The project started in France, but was quickly under the radar of several 3D and web specialists around the globe as well as some gaming studios. We were happy about the community’s feedback but the traffic was manageable! But the experience on the website was still good enough. Loading our scenes was not done at stellar speed but users were not complaining that much. Game over for our little server! It slowly stopped working and the experience for our users was really bad. The IIS server was spending its time serving large static assets and images, and the CPU usage was too high. 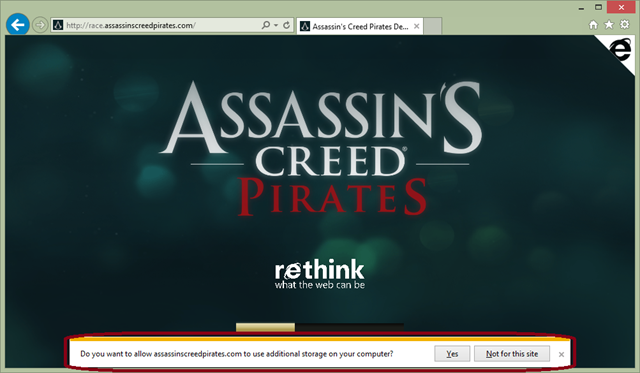 As we were about to launch the Assassin’s Creed Pirates WebGL experience project running on babylon.js, it was time to switch to a more scalable professional hosting by using a cloud solution. Everything is static on our website. We currently don’t have any server-side code running. Our scenes (.babylon JSON files) and textures (.png or .jpeg) files could be very big (up to 100 MB). This means that we absolutely needed to activate gzip compression on our “.babylon” scene files. Indeed, in our case, the pricing is going to be indexed a lot on the outgoing bandwidth. Drawing into the WebGL canvas needs special security checks. You can’t load our scenes and textures from another server without CORS enabled for instance. Credits:I’d like to special thank Benjamin Talmard, one of our French Azure Technical Evangelists who helped us move to Azure. As we’d like to spend most of our time writing codeand features for our engine, we don’t want losing time on the plumbing. That’s why, we immediately decided to choose a PaaS approach and not a IaaS one. Moreover, we liked Visual Studio integration with Azure. I can almost do everything from my favorite IDE. 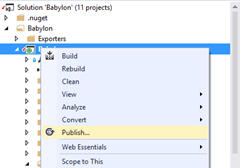 And even if babylon.js is hosted on Github, we’re using Visual Studio 2013, TypeScript and Visual Studio Online to code our engine. As a note for your project, you can get Visual Studio Community and an Azure Trial for free. I created a new Web Site in the admin page: http://manage.windowsazure.com (could be done inside VS too). I took the right changeset from our source code repository matching the version that was currently online. 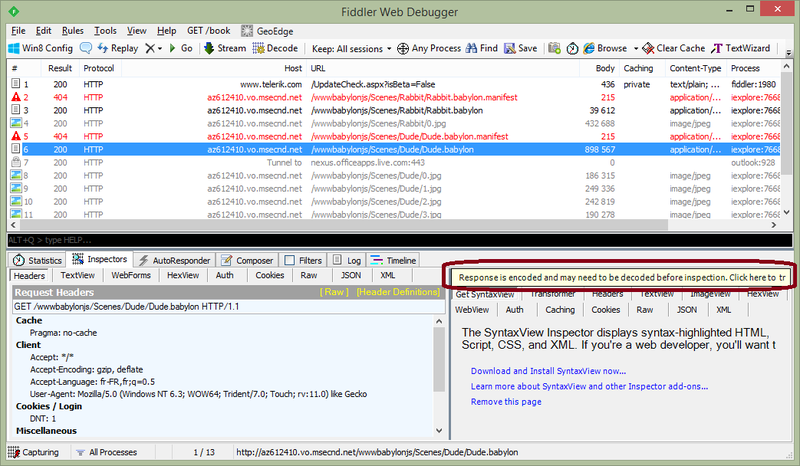 I right-clicked the Web project in the Visual Studio Solution Explorer. Here comes the awesomeness of the tooling. 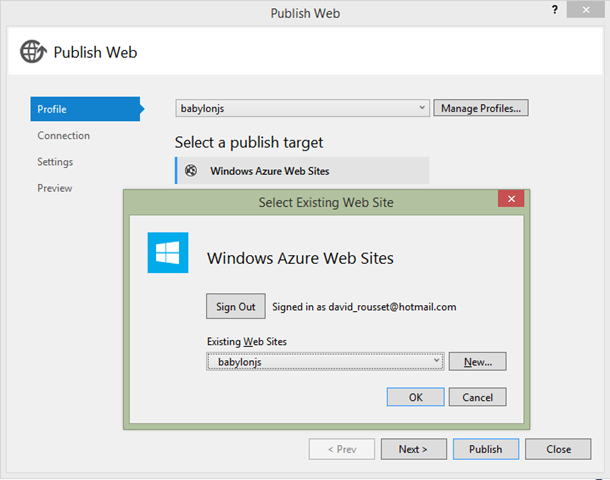 As I was logged into VS using the Microsoft Account boundto my Azure subscription, the wizard let me simply choose the web site on which I’d like to deploy. No need to worry about complex authentication, connection strings or whatever. “Next, Next, Next & Publish” and a couple of minutes later, at the end of the uploading process of all our assets and files, the web site was up and running! On the configuration side, we wanted to benefit from the cool autoscale service. It would have helped a lot in our previous Hacker News scenario. First, your instance has be configured in “Standard” mode in the “Scale” tab. Then, you can choose up to how many instances you’d like to automatically scale, in which CPU conditions and also on which scheduled times. In our case, we’ve decided to use up to 3 small instances (1 core, 1.75 GB memory) and to auto-spawn a new instance if the CPU goes over 80% of its utilization. We will remove one instance if the CPU drops under 60%. The autoscaling mechanism is always on in our case, we haven’t set some specific scheduled times. The idea is really to only pay for what you need during specific timeframes and loads. I love the concept. 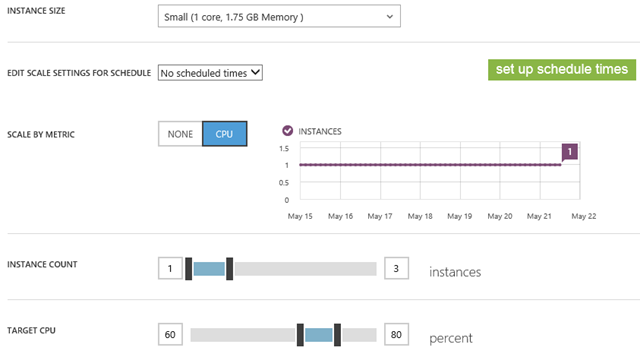 With that, we would have been able to handle previous peaks by doing nothing thanks to this Azure service! This what I call a service. You’ve got also a quick view on the autoscaling history via the purple chart. In our case, since we’ve moved to Azure, we never went over 1 instance up to now. And we’re going to see below how to minimize the risk into falling into an autoscaling. To conclude on the web site configuration, we wanted to enable automatic gzip compression on our specific 3D engine resources (.babylon and .babylonmeshdata files). This was critical to us as it could save up to 3x the bandwidth and thus… the price. This solution is working pretty well and we even noticed that the time to load our scenes has been reduced compared to our previous host. I’m guessing this is thanks to the better infrastructure and network used by Azure datacenters. However, I have been thinking about moving into Azure for a whilenow. And my first idea wasn’t to let web sites instances serving my large assets. Since the beginning, I was more interested in storing my assets into the blob storage better designed for that. It would offer us also a possible CDN scenario. The primary reason for using blob storage in our case is to avoid loading the CPU of our web site instances to serve them. If everything is being served via the blob storage except a few html, js&css files, our web site instances will have few chances to autoscale. Azure Blob Storage doesn’t support automatic gzip compression. And we don’t want to lower the CPU web site usage if in exchange we’re paying 3x time the price because of the increased bandwidth! As you can see, the green log lines imply that everything works well. In conclusion, if you see that your calling domain is not found in the “Access-Control-Allow-Origin” header with an “Access is denied” just after that, it’s because you haven’t set properly your CORS rules. It is very important to control your CORS rules; otherwise, anyone could use your assets, and thus your bandwidth, and thus costingmoney without letting you know! gzip yourself the files on the client and upload two versions in the blob storage: one with the default .extensionand one with the .extension.gzip, for instance. Set up a handler on the IIS side that will catch the HTTP request from the client, check for the header accept-encoding set to gzip and serve the appropriate files based on this support. You’ll find more details on the code to implement in this article: Serving GZip Compressed Content from the Azure CDN. In our case, I don’t know any browser supporting WebGL and not gzip compression. So if the browser doesn’t support gzip, there’s no real interest in going further as this probably means that WebGL is not supported either. Using 7-zip, I am compressing the .babylon files on my machine using gzip encoding and compression level to fastest. The other compression levels seems to generate issues in my tests. I upload the file using CloudBerry Explorer for Microsoft Azure Cloud Storage. 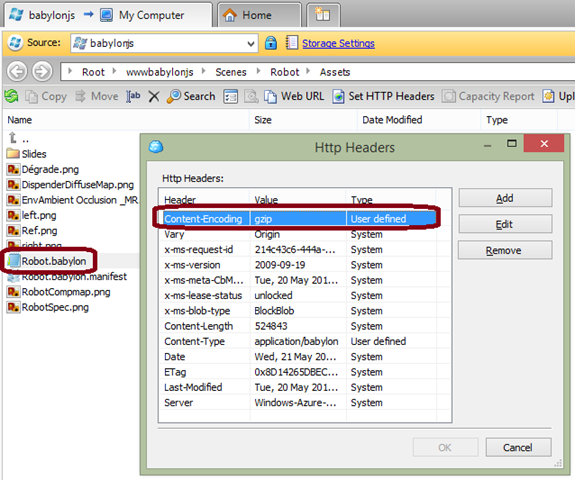 I manually set the HTTP header content-encoding to gzip with CloudBerry. Or simply UploadAndGzipFilesToAzureBlobStorage Scenes/Espilit C:\Boulot\Babylon\Scenes\Espilit\Espilit.babylon to push a unique file. It is that simple! In my case, I need to simply change the following URL http://yoda.blob.core.windows.net/wwwbabylonjs/Scenes to http://az612410.vo.msecnd.net/wwwbabylonjs/Scenes. Note that you can customize this CDN domain to your own if you want to. Thanks to that, we are able to serve you our 3D assets in a very fast way as you will be served from one of the node locations listed here: Azure Content Delivery Network (CDN) Node Locations. Our web site is currently hosted on the Northern Europe Azure data center. But if you are coming from Seattle, you will ping this server just to download our basic index.html, index.js, index.css files and a couple of screenshots. All the 3D assets will be served from the Seattle node just near you! Note: All our demos are using the fully optimized experience (blob storage using gzip, CDN & DB caching). Optimizing loading times and controlling output bandwidth costs is not just about server-side.You can also build some logic client-side to optimize things. Fortunately, we have done that since v1.4 of our babylon.js engine. I have explained in great details how I have implemented the support for IndexedDB in this article: Using IndexedDB to handle your 3D WebGL assets: sharing feedbacks & tips of Babylon.JS and you will find how to activate it in babylon.js on our wiki: Caching the resources in IndexedDB. Basically, you just have to create a .babylon.manifest file matching the name of the .babylon scene,then set what you’d like to cache (textures and/or JSON scene).That’s it. 1 item and 348 bytes! We are just checking if the manifest file has changed. If not we are loading everything from the DB and we are saving 43+ MB of bandwidth. Lets think about that: the game launches almost immediately once it has been loaded once as the assets are served directly from the local DB – your web storage is less stressed and less bandwidth is used costing you less money! Now that will satisfy both your users and the person paying the bill! This article is part of a web dev tech series from Microsoft. We’re excited to share Microsoft Edge and its new rendering engine with you. Get free virtual machines or test remotely on your Mac, iOS, Android, or Windows device at modern.IE.